PROC VARIOGRAM features automated semivariogram fitting. In particular, the procedure selects a theoretical semivariogram model to fit the empirical semivariance and produces estimates of the model parameters in addition to a fit plot. You have the option to save these estimates in an item store, which is a binary file format that is defined by the SAS System and that you cannot modify. Then, you can retrieve this information at a later point from the item store for future analysis with PROC KRIGE2D or PROC SIM2D. After you run the procedure you get a series of output objects from the fitting analysis. In particular, Figure 122.10 shows first a model fitting table with the name and a short label of the model that you requested to use for the fit. The table also displays the name and label of the specified item store. If you specify no parameters, as in the current example, then PROC VARIOGRAM initializes the model parameters for you with default values based on the empirical semivariance; for more details, see the section Theoretical Semivariogram Model Fitting. The initial values provided by the VARIOGRAM procedure for the Gaussian model are displayed in the table in Figure 122.11. Otherwise, in PROC VARIOGRAM you can specify initial values for parameters with the PARMS statement. Alternatively, you can specify fixed values for the model scale and range with the SCALE= and RANGE= options, respectively, in the MODEL statement. A nugget effect is always used in model fitting. Unless you explicitly specify a fixed nugget effect with the NUGGET= option in the MODEL statement or initialize the nugget parameter in the PARMS statement, the nugget effect is automatically initialized to zero. See the section Syntax: VARIOGRAM Procedure for more details about how the MODEL statement and the PARMS statement handle model parameters. The output in Figure 122.12 comes from the optimization process that takes place during the model parameter estimation. The optimizer produces an optimization information table, information about the optimization technique that is used, optimization-related results, and notification about the optimization convergence. The fitting process is successful, and the parameters converge to the estimated values shown in Figure 122.13. For each parameter, the same table also displays the approximate standard error, the degrees of freedom, the t value, the approximate p-value, and the requested 95% confidence limits. 0 0 0 0 8 . . The approximate covariance matrix of the estimated parameters is displayed in Figure 122.14. The fitting summary table in Figure 122.15 displays statistics about the quality of the fitting process. In particular, the table shows the weighted error sum of squares in the Weighted SSE column and the Akaike information criterion in the AIC column. See more information about the fitting criteria in section Quality of Fit. Figure 122.16 demonstrates the fitted theoretical semivariogram against the empirical semivariance estimates with the weighted least squares method. The fit seems to be more accurate closer to the origin , and this is explained as follows: A smaller corresponds to smaller semivariance; in turn, this corresponds to smaller semivariance variance, as shown in the section Theoretical and Computational Details of the Semivariogram. 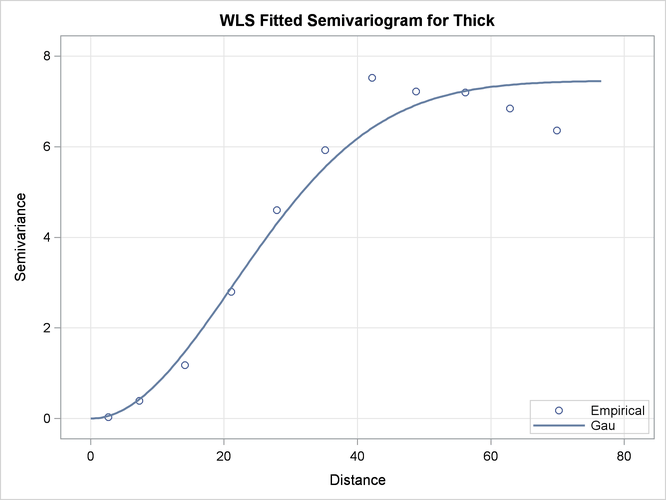 By definition, the WLS optimization weights increase with decreasing variance, which leads to a more accurate fit for smaller distances in the WLS fitting results.